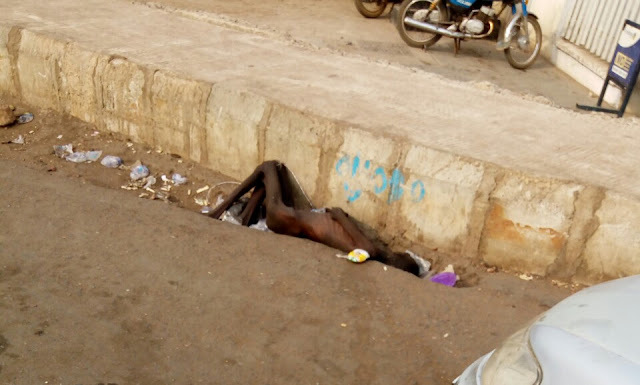 This collection of bones and skin lies infront of First Bank Owode branch in Oyo Town. It's been 3days that he has been there completely helpless. My findings this morning on my way to church indicated that he walked haggardly down there from Ibadan road, many people at first chased him away on sighting him. He attempted to leave, but collapsed on getting to that spots, people gave him money and food, but it was of no use to him, as he was too frail to make use of them. All he needed was urgent medical attention, but non came till his soul departed in the early hours of today. It was a tear dripping sight. How I wished the people that mattered got to know earlier than now. But now, all hope is lost. The First Bank security guard I spoke with said they have informed the sanitation department of Oyo West Local Government, and they came and took his pictures yesterday, with a promise to come and rescue him immediately. But, they haven't shown up till the time of filing this report. At least, let us re-inform them to come and pick up his corpse to forestall health hazard. Let us all henceforth report situations like this to appropriate quarters immediately, to forestall unnecessary loss of human lives. 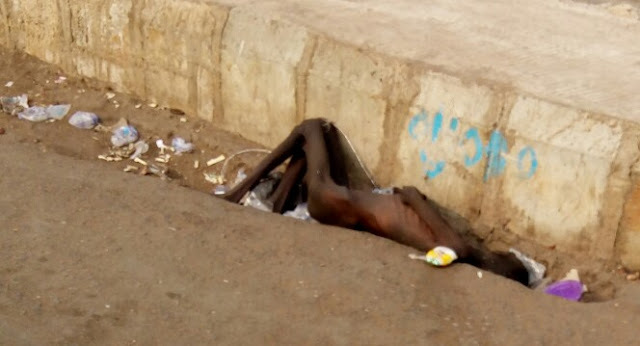 0 Response to "How Nigerians Watch A Young Man Died Of Starvation And ill Health"